The Division of Cultural Affairs is advancing a recommendation to fund $62 million ($61,660,924) in the General Program Support matching grant program to 666 organizations from across the state. There are 52 PBC-based organizations vying for $6.3 million ($6,347,740), just over 10% in four areas: Cultural Endowment, Cultural Facilities, General Program Support and Specific Project Support. The Cultural Council (and Cultural Coalition) recommends full funding of all projects. Background: The 2018-2019 $88.7 billion state budget included $2.6 million for art and culture. 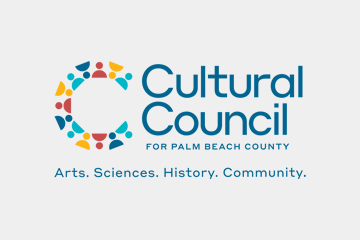 Those funds were shared among 489 organizations across the state (39 in Palm Beach County) recommended by the Department of Cultural Affairs (DCA) for matching grants. This is a 90% decline from the 2017-2018 budget and only 6% of the full recommendation of $55 million. This year’s funding level moved Florida from 10th to 48th in per capita appropriations for the arts for the nation’s 3rd largest state (National Assembly of State Arts Agencies). The Cultural Council is also monitoring legislative issues related to tourism, including funding for Visit Florida and any legislation that restricts or expands the use of bed tax dollars. The Cultural Council is advocating for $100,000 in additional funding for the C1 grant program in an effort to restore funding to $400,000 level (currently $250,000).